Rufus Wainwright’s earliest memories of singing are basically a hip, 70s version of that bit in The Sound Of Music where the Von Trapp children entertain party guests before being sent to bed, except instead of Austrian aristocracy it was the hipster art and musician friends of his mother or father, and instead of sweetly saying goodnight, it was Rufus and his elder sister Martha nursing their mother's friends through their come-downs. 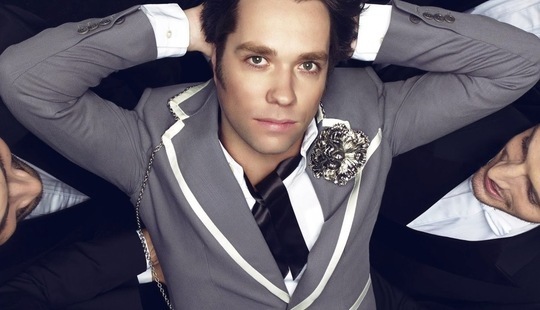 If you know anything about Rufus Wainwright, you know he’s the progeny of folk royalty. It’s Wainwright 101. His parents were folk singers Kate McGarrigle and Loudon Wainwright III, his aunts were folk singers Anna McGarrigle and Sloan Wainwright, his sister is singer Martha Wainwright… you get the picture. What’s unavoidable when you speak to either of the Wainwright siblings is how completely central their parents careers were to their own developing musical identities. “My mother and my aunt really encouraged their kids to sing with them, ever since we were young children,” Martha said once, “I remember standing with them behind me, yanking on my hair if I got it really wrong.” Baby brother Rufus, now 40, married to long-term partner Jörn Weisbrodt, and with a daughter of his own (Viva Wainwright Cohen, whose mother is Lorca, daughter of Leonard, more of whom later...) has carved out a career making cinematic pop music, his beautiful melancholic tenor turning everything into a torch song. In a career edging two decades he’s written an opera (there’s a second on the way) covered Judy Garland’s 1961 Carnegie Hall show note for note, and released seven solo albums. With the release of his first proper Best Of (“not a Greatest Hits” he’s quick to point out), Vibrate- The Best of Rufus Wainwright this seems as good a time as any to trace that journey. It’s these aspects that have always set Wainwright apart from other singer/songwriters of his generation, the post-post ironic pop/rock contemporaries of the late 90s. There was always something more sincere in the likes of ‘Foolish Love’ from his debut - a relationship as much with musical theatre, jazz standards and, yes, opera than his folky roots would lead you to expect. It comes, not too surprisingly, from the teenage Rufus’ discovery of opera. “I was blindsided, sideswiped by opera at a very tender age.” He says, “I was thirteen or fourteen and opera erupted into my life and it was all I could listen to. I had been a somewhat normal teenager before listening to Eurythmics and Cyndi Lauper or whatever of that era, and maybe I’d have gone on to be more of a typical teenager and gotten into Nirvana and stuff, but opera took over. I was in shock for a few years, because I didn’t understand this ravenous appetite I had for this music, and what it was and where it fit, I just knew that I had to keep going.” The impact of opera in his music is undeniable, “I tend to think of a song as more of an aria than a verse-refrain standard piece”, he says. It’s a fair point, especially for an artist whose influences are as much theatrical, operatic and old crooners as anything else. In those worlds it’s the performance, the reinterpretation of a song that’s important. That’s where standards come from. Wainwright famously idolises Judy Garland, who was hardly known for writing her own work - her performances are so mesmerising all previous versions become a little redundant. ‘Hallelujah’ is, of course, a fairly bulletproof song, that even survived Alexandra Burke’s X-Factor version (it had a choir and a key change, natch), but there is something magical about Wainwright’s - his yearning vocal suits its downbeat mood perfectly. Vibrate: The Best Of Rufus Wainwright is out now. Rufus plays the Theatre Royal, Drury Lane in London on April 6th 2014.